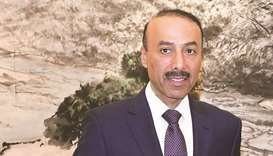 Ambassador of Qatar to China, Sultan bin Salmeen al-Mansouri, has praised the deep-rooted and strong relations and the strategic partnership between Qatar and China, especially in terms of the shared visions on sustainable development. In an interview with Qatar News Agency (QNA), the Qatari ambassador said that the visit of His Highness the Amir Sheikh Tamim bin Hamad al-Thani to China at the beginning of this year was a complement to the visit by him in 2014, which was a historic visit by all standards, stressing that the visit established a strategic partnership between the two countries through a number of bilateral agreements, whether in the cultural, financial or investment fields, as well as co-operation in the Belt and Road Initiative. The ambassador added that recent visit opened up wider horizons for co-operation and strengthening of strategic partnership, where bilateral relations were strengthened further by the signing of more agreements in the field of culture and tourism, noting that the most prominent of the agreements signed was the one to hold a strategic dialogue between the two sides. He underlined that Qatar attaches great importance to the strategic dialogue with all countries, especially with China, as it has created more common ground and strengthened the bilateral relations in all fields. The ambassador highlighted the significance of the Qatar-China Friendship Association which will open the door to popular diplomacy, as well as sports and educational agreements along with agreements concerning Qatari investments in China and Chinese investment in Qatar. He added that the Chinese market is promising and stable, noting that there is a study to strengthen the presence in the Chinese market for the opportunities it enjoys for development and investment. On the volume of trade exchange between Qatar and China, ambassador Sultan bin Salmeen al-Mansouri said that the volume of trade exchange is increasing especially in recent years, indicating that it reached about $10bn in 2017 and nearly $11bn in 2018. He added that the value of Qatari exports to China exceeds the value of imports, explaining that Qatar is one of the few countries whose exports exceed the value of imports with China because China is one of the largest importers of the Qatari gas. The ambassador underlined a strong relationship between Qatar and China in the field of gas export, especially in light of China’s approach to sustainable development and clean energy. Qatar is among the first countries to supply gas to China, covering about 40% of China’s needs, which exceeds 10mn metric tonnes, and this number is increasing due to the increasing and continued demand by China. Meanwhile, Qatar’s imports from China in 2018 reached $2bn, while its annual export to China worth $9bn and is growing, the ambassador added. In this context, he referred to the opening of two direct maritime routes from China to Qatar for the transport of goods and consumables, noting that Qatar imports most of the needs of the Qatari market from China through two ports, one is in Shanghai and the other is in Guangzhou, via two direct routes to the Hamad Port. On co-operation in the Belt and Road Initiative, launched by Chinese President Xi Jinping in 2013, the ambassador said that Qatar has studied the initiative in all respects and found it to be a valuable initiative. Therefore, Qatar signed an agreement with China in 2014 to co-operate in the implementation of the initiative. The role of Qatar in the initiative is not limited to joining and approving the related agreements, but rather to participating in and contributing to the implementation of this vision and initiative. Qatar participated as a founder in the Asian Infrastructure Investment Bank, and has facilitated the work of Chinese banks in Qatar, the Qatari ambassador said, noting that two Chinese banks are operating in Qatar - the People’s Bank of China and the Commercial and Industrial Bank of China, in addition to the establishment of a currency exchange centre for the (renminbi) which not only serves Qatar but the Middle East and part of North Africa. Ambassador Sultan bin Salmeen al-Mansouri referred to the establishment of a national committee chaired by the Ministry of Foreign Affairs to co-operate in the field of the Belt and Road Initiative, in addition to establishing a committee from both sides to study infrastructure projects and what’s best suited to Qatar and China in the implementation of projects, while stressing that Qatar is active in all meetings and forums related to the initiative. The ambassador said that the initiative is based on five fundamental principles; strengthening policies, improving infrastructure, promoting trade, capital development and communication among people. He added that Qatar is now benefiting from this initiative, especially since there is harmony, co-operation and convergence in the visions between Qatar, China and various countries on the Silk Road. He pointed out that in 2018, Chinese President Xi Jinping launched an initiative to open up China to the world and welcomes foreign investment. The ambassador said that China organised the first and largest import exhibition in the same year, in which almost all countries, including Qatar, participated in. On Qatar’s hosting of the 2022 FIFA World Cup and the Chinese presence in the preparations related to the tournament, the ambassador said that given the Chinese companies’ experience in the field of infrastructure, Qatar has attracted Chinese firms. He added that the biggest stadium to host the tournament, Lusail Stadium, which will feature the opening and closing ceremony of the tournament, was built by a Chinese company, as well as the Hamad Port. He noted that there are more than 180 large and medium Chinese companies operating in Qatar, both in infrastructure projects or communications in several areas. On the Qatari companies operating in China, he pointed out that there are joint companies operating in China. He added that the most prominent of these companies are four companies have been awarded a number of projects related to the 2022 FIFA World Cup as well as two Qatari banks working in China, Qatar National Bank and Doha Bank, which operate in Shanghai’s financial district. As for tourism and exemption from visas between the two sides and the impact on the tourism movement in the country, the ambassador pointed out that the number of Chinese tourists travelling abroad in the past five years is increasing and that the number is likely to increase further during the next five years, and the Chinese people love to travel and learn about cultures. He said that the measures taken by Qatar to exempt Chinese citizens from entry visas have an impact on the tourism movement, which has led to a 35% increase in the number of Chinese tourists. The ambassador pointed out that number of Qatari tourists visiting China is also increasing due to the similar measures taken by the Chinese government to exempt Qatari citizens from entry visas. Qatar Airways operates from seven airports in China and has a strong demand in China to travel to several destinations in Qatar, the ambassador noted, adding that Qatar Airways is well positioned to serve the needs of travellers around the world, which includes Chinese people and that it is Qatar’s source of pride. He pointed out the importance of culture for communication between the two friendly countries, with the Chinese people being open to other cultures and like to open up and share with others their culture, a friendly, peaceful and welcoming people. On the Chinese position on the blockade imposed on Qatar, the ambassador said that China has a firm principle of non-interference in the internal affairs of other countries since the beginning of the blockade. He added that they believe in neutrality. China supports the Kuwaiti mediation led by Amir Sheikh Sabah al-Ahmad al-Jaber al-Sabah to resolve the dispute. China has supported this mediation and insists that this crisis must be resolved in the Gulf through dialogue and understanding between all parties. The ambassador pointed out that Qatar will participate in the gardening exhibition to be held at the end of April in China and will continue to do so for four months. He emphasised that the participation of Qatar in the exhibition is due to its experience in the field of horticulture and agricultural solutions, where a large pavilion will be held in a unique way that reflects Qatar’s cultural and cultural image in co-operation with the Ministry of Municipality and the Environment.